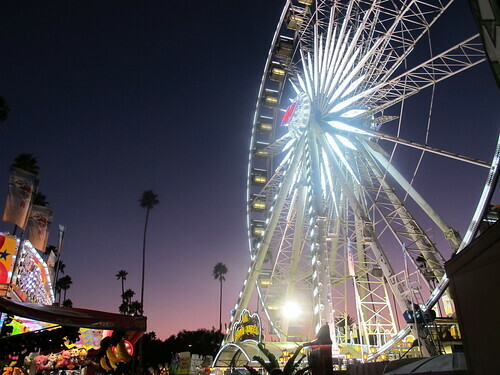 In this requisite annual post I present to you more of the myriad reasons why I love the LA County Fair. Among them are taking photographs of the ferris wheel at sunset, eating strange fried food and finding random tiki sightings. 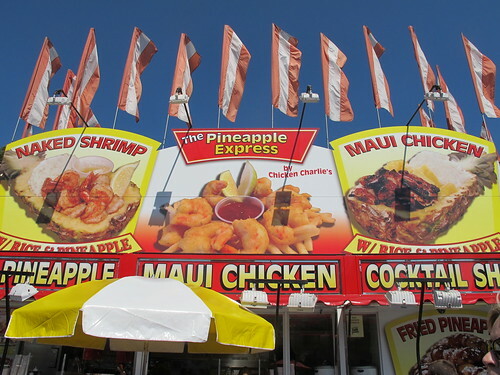 Chicken Charlie is famous for serving up deep-fried delights, but this year he introduced a new stand called The Pineapple Express that offered some island-inspired options that were promoted as healthier than your typical fare fair. 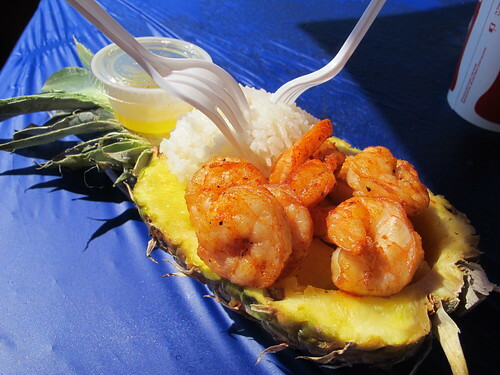 One of these was the “Naked Shrimp” ($11.95) with white rice and pineapple chunks, served in half a pineapple shell. If you’re concerned this dish sounds too healthy, don’t worry, they also give you a side of melted butter! The shrimp looked like they might have some spice, but were pretty bland. 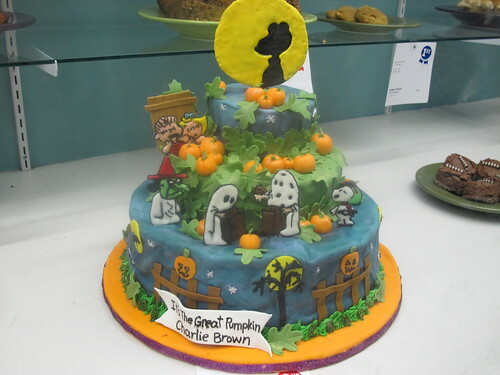 I appreciated the novelty presentation, but we’ll skip this next year. 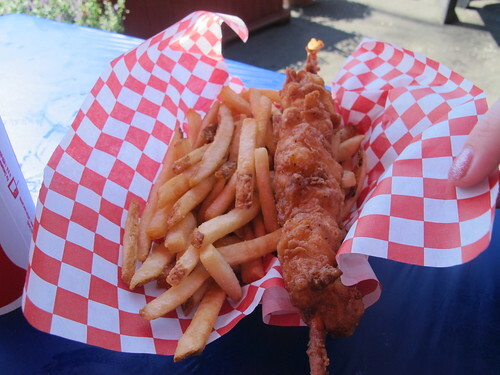 On the other hand, the deep-fried lobster on a stick ($12.87) was juicy inside and the crisp coating had great seasoning. Of course, Chicken Charlie couldn’t stray too far from his roots so there was also deep-fried Spam and deep-fried pineapple rings with chocolate sauce (both $6.44) to continue the Hawaiian theme. Not surprisingly, the latter wasn’t very good. I guess the deep-fried Klondike Bar shall remain my all-time favorite. Even though we went at the end of September, the weather was still hotter than it had any business being. 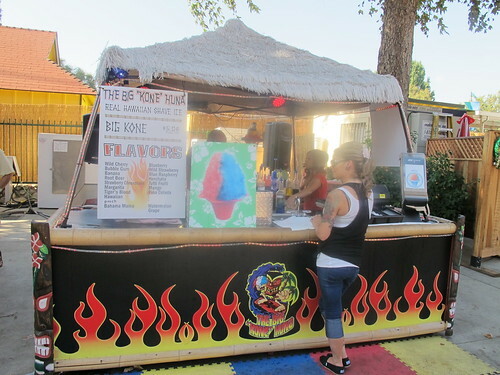 We paused to cool off with some shave ice at The Big “Kone” Huna, which I think might have been a new food vendor at the LA County Fair this year. Their stand had a thatch roof, some tiki masks and bamboo poles, but also hot rod flames, disco lights and dance music, so that was a bit odd. 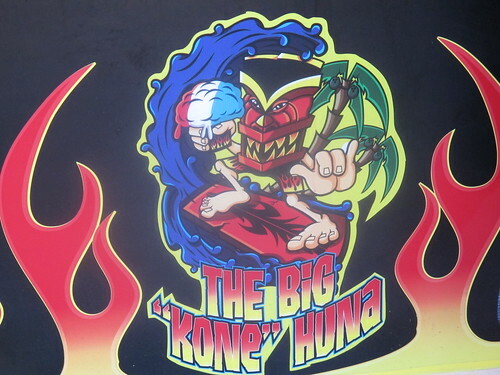 As was their logo with a surfin’ dude in a scary-looking tiki mask. Yikes. 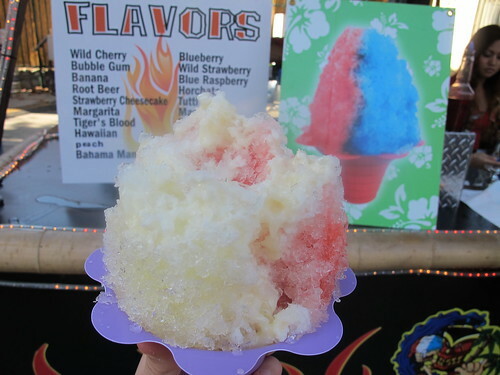 We couldn’t decide what flavors to get so we went with their suggestion of strawberry and pina colada “Hawaiian style” with sweetened condensed milk on top ($5.06). It was pretty good, though I kept stealing spoonfuls from our friends’ order of lime and margarita. Of course this table caught my eye! 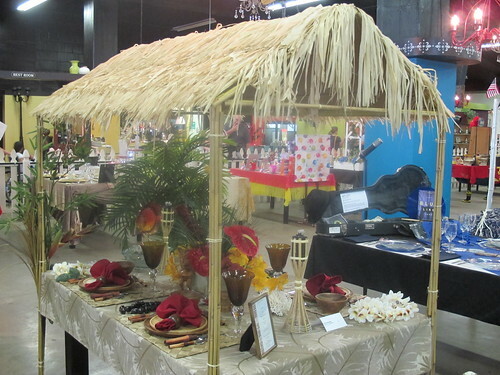 It was inspired by James Michener’s book Hawaii, and featured a thatch roof over the table, woven palm frond placemats, monkey pod wood dishes, mini tiki torches, fake tropical flowers and tiki salt and pepper shakers. 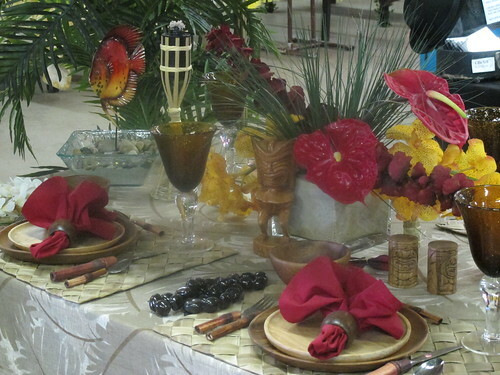 The Hairpin has some great pictures of some of the other tablescaping entries (including one for Game of Thrones!). 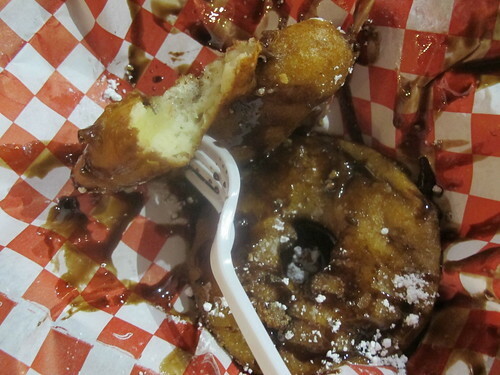 LA County Fair 2010 – Chocolate Covered Oreos Wrapped in Bacon!